I always start by creating a little seasonal vignette on the island and then I just pull the colors from there. This years is mostly blue and white with a touch of apple green here and there. The only thing I bought new is this pretty embroidered runner from HomeGoods. And on my old wood tray, I created a small centerpiece using some old plates. The white ones are from Homegoods, the blue ones from Kirklands. To make it a little higher, I placed my ceramic stand and for some more color I added some pretty napkins I had from the Pioneer Woman collection. But, even before I did all this, I had spent two whole days cleaning and organizing my kitchen. 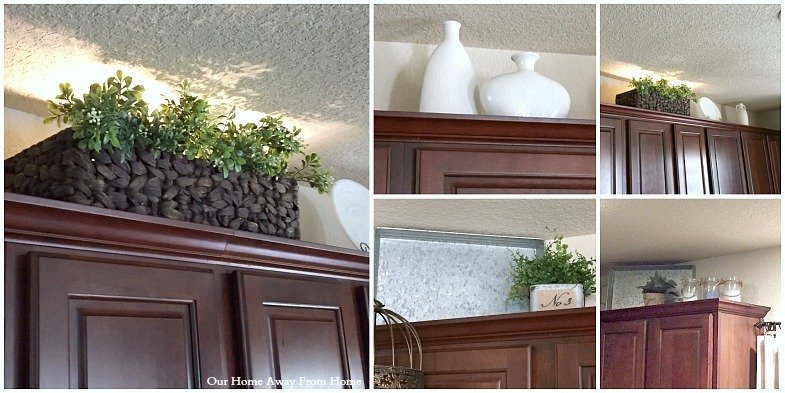 I removed everything from the top of the cabinets and changed the decor using some galvanized trays and a lot of creamy white decor items to create a lighter look. These were things I already had and that I sprayed painted using Heirloom White. I also got rid of all the greenery and just added a couple of green containers here and there. On the corner of the counter I added a pretty kitchen print. I left the kitchen window the same as it has been since January. A few more changes were made to the breakfast area. I made some new pillow covers in the same colors as the island vignette. I replaced the placemats with white ones I already had and I used again the old box with burlap flowers from last year. And that is it on the kitchen spring decor, but before I go, did you noticed the big new item in our kitchen? You won't believe me, but the same week our son got sick, our fridge decided to quit working completely. What a disaster that was! Specially since I had just gone to the grocery store and it was full of fresh food. 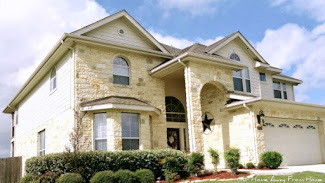 After going back and forth with repair company, we were told there was no fixing it, so, as soon as we had a chance, we shopped for a new one, but it was a special order and we were without a fridge for six days. Between one thing and another, it sure was a long and difficult week for us. When it rains, it pours. We couldn't be any happier with our new fridge. It has a excellent ice and water dispense. Water taste just like bottle water. The inside is beautiful and huge. We bought the model with the little door on the side, which it has proven to be very convenient. And the freezer has three wonderful departments that hold a lot of groceries and extra ice. One of the best features of the freezer is that you push the door half way and it closes by itself so you never have to worry about it staying opened. We are extremely happy with our new purchased and we even noticed the food stays fresh longer. I hope you enjoyed this little tour of our kitchen. I will be back soon with some more spring decor in our family room. Until then, thank you all so much for stopping by. I did love the post, Maria. I went with blue and white a while back, too, and love it. I really love the little pops of green you have added. I have added it, too, with plants. Too bad about your son and fridge--both at the same time! I love our French-door fridge, too. It is so convenient. It would be hard to go back to a standard one now, I think. 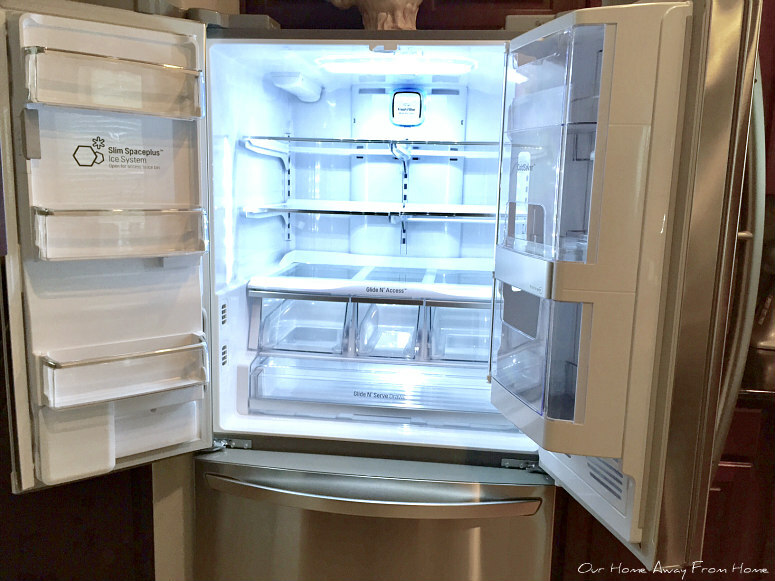 Your Spring decor looks beautiful and your new fridge is gorgeous!!!! I hope things start looking better for you!!! 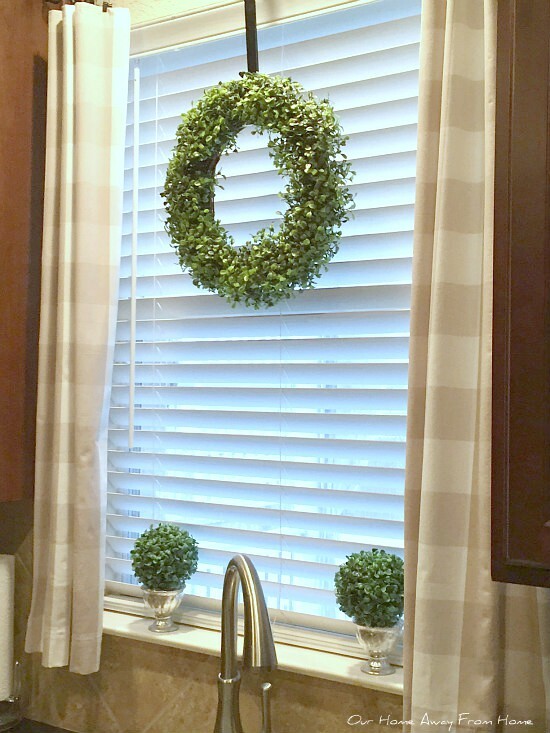 Your spring decor in the kitchen looks great! I love the colour combo and especially those blue/white buffalo check napkins and the checked pillows on the chairs at your table. You've been busy with the kitchen cleaning and new decor on top of your cabinets - I like what you've done. That fridge looks terrific - you deserve something nice after all you've been through. I always enjoy seeing your island decked out for the season...love the cute bunnies and those candle holders are so pretty! Really like the new fridge, too! 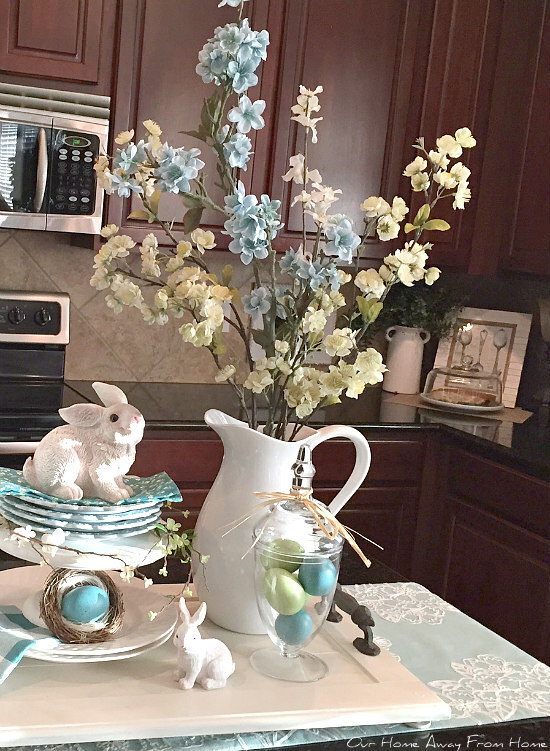 Beautiful decor for Spring! I love the box at the center of the table. Wonder where you got it. It's fun to get a brand new appliance! Desejando una linda primavera! Your spring decor looks beautiful! I love the soft blue and white together. Your fridge sure is nice. What brand is it? We got a new fridge last year. It's an LG. So far we love it. Our washing machine just recently stopped working properly and it's not old. We got it repaired but I think we will avoid buying that brand in the future. It's a GE.